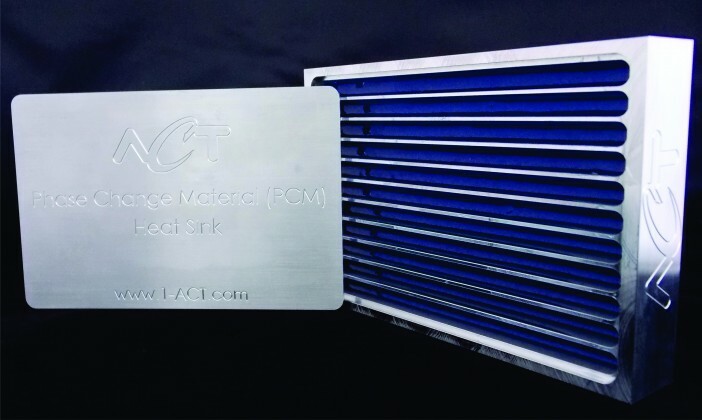 Lancaster, PA September 14, 2016 – Advanced Cooling Technologies (ACT), announced today it has increased its design and manufacturing capabilities to meet increasing demand for its Phase Change Materials (PCM) heat sink products. These temporary thermal storage solutions are becoming a critical element in military applications involving short mission durations, pulse mode operation, and directed energy. In these heatsinks, the PCM absorbs heat during device “on” times, without increasing temperature, by undergoing a solid to liquid phase change. The heat is dissipated during device “off” times through the reverse liquid to solid phase transition. This method allows for simple, lightweight thermal solutions. In many cases, complex liquid or air cooled systems can be replaced or coupled with a thermal storage component to reduce size, weight and power (SWaP). “With these improvements our customers can be confident we are supplying the most cost effective and highest quality PCM Heat Sinks available,” Weyant concluded. ACT specializes in advanced thermal technology development and custom thermal product manufacturing. ACT designs and manufactures cold plates, HiK™ plates, heat pipes, pumped liquid and two-phase loops and thermal storage devices for customers in diverse markets including Aerospace, Electronics, Temperature Calibration, Medical Device, and Energy Recovery Systems. ACT’s team consists of personnel with established track records in technology development, commercialization and production. Many of them were involved in the pioneering work on heat pipes, loop heat pipes and other single and two-phase heat transfer devices. They are the inventors/co-inventors on numerous U.S. and international patents and the authors/co-authors of hundreds of scientific publications. The R&D team at ACT has engineers with backgrounds in mechanical, electrical, chemical, aerospace, nuclear, materials, manufacturing and physics. Their expertise assures we can serve wide variety of material, thermal and modeling challenges in diverse applications. ACT’s Facility measures more than 50,000 square feet, including office, laboratory and manufacturing spaces. With ISO9001 and AS9100 certified quality system in place, the facility has designed and manufactured high quality, cost effective, thermal management solutions for dozens of mission critical satellite, and military programs as well as for numerous commercial applications. Simultaneously ACT’s broad and diverse R&D efforts are developing thermal solutions for tomorrow’s emerging technologies. For more information about ACT, please visit www.1-ACT.com.